ROAD TOWN, Tortola, VI - As the territory's infrastructure was severely destroyed by hurricanes Irma and Maria in September 2017, His Excellency the Governor Augustus J. U. Jaspert announced plans to implement an Architects and Engineers Registration Bill which will ensure high standards when rendering services to private and public sectors. Governor Jaspert was at the time delivering the Speech from the Throne at the First Sitting of the Third Session of the Third House of Assembly of the Virgin Islands on Thursday, March 1, 2018. “Our government will seek to introduce the Architects and Engineers Registration Bill, to ensure that all practicing architects and professional engineers provide services to private and public sectors at an acceptable industry standard, which in turn would ensure the optimum health and safety of building occupants," the Governor explained. Governor Jaspert further stated that there are plans to have proper building codes to ensure that they meet safety and quality development for the future. Meanwhile, many residents of the territory felt the effects of builders short changing them in the building of homes and businesses. A majority of the roofs and even some concrete buildings were flatted. 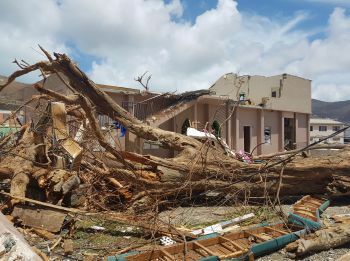 Speaking with a construction worker residing in the territory for more than five years, Dwayne A. Thompson stated that most of the buildings that were destroyed, especially the concrete buildings, were not built with steel. "I noticed most of the buildings, specifically the concrete ones, did not have steel or it was put in wrong. The contractors taking shortcuts when building these buildings. I hope they learn this time around," the construction worker said. One resident said, "Irma was a strong hurricane but can you imagine that a concrete building that you expect to stay up, some of them mash up totally. Those buildings weren't built properly in the first place." This is especially true of the public schools from my observations. 6 months on, and still very few functioning public schools. 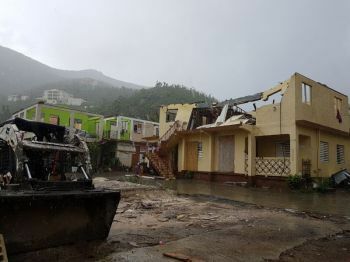 We should also stop the building of innapropriate and out of place buildings in BVI. They don’t look good and they failed to stand up to the hurricanes as well as tradional four sloping sides Caribbean buildings. Look for evidence along Spyglass hill or at Scotia Bank in RT. Lets have planning that demands that buildings are designed to be appropriate for the climate and that look like they are in the tropics and not in Sweden or Montreal. Those builders whose concrete structures withstood the hurricane and those that did not should be identified. It is only fair to the public, the majority of whom will be looking for and hiring contractors. There should be a buyer beware listings of contractors. This is indeed so true because most of these contractors can’t drive a nail properly. A lot of them get hold of a contractor license because they have friends in places. For all of us who are rebuilding, we have to make sure it is listed that contractors have steel listed in part of the strengthening of our buildings, and we must be on site for them to show us steel has been put in before they cover it up. We were not aware that this is vital for the longevity of our buildings and our safety. Hurricanes Irma and Maria were major Cat 5 catastrophic storms that no doubt would have caused significant property damages. Nonetheless, the two storms and resulting damages expose weaknesses in building construction, especially roof construction. Many properties lost their roofs in the hurricanes; poor construction may have contributed to the roof damages. Proper structural design requires that the roof structure is tied securely to the bearing walls, bearing walls tied to the foundation and foundation to the soil. A continuous load path is required to transfer loads from the roof to the foundation to the soil. Particular attention is needed for windows and doors; systems much be tied together and continuous load path created around openings. A well-designed building must be supported by strong construction and inspection for a complete project. Permit acquired, government in-house or contracted qualified and certified inspectors must inspect construction projects, ie, foundation, structural systems, electrical, plumbing, mechanical, air conditioning, roofs, specialty items( elevators...etc) ........etc. Each system must pass inspection before a certificate of occupancy is issued. Moreover, inadequate or missing reinforcement (steel) was raised as an issue in the commentary. The design engineer should calculate the size, quantity, placement and location of steel on construction projects. Inspectors should ensure steel is consistent with at least the minimum design requirements. Many walls are constructed with CMU (concrete masonry unit; block). To meet the minimum design strength and structural integrity, blocks should be core filled and reinforced with steel from foundation to roof. Will you please be my contractor's s manager. Or give me a listing of reputable dependable knowledgeable workmen....carpenter,mason ,electrician. The rubber meets the road with contractors and builders. You can have all tge legislation in the world regarding architects and engineers but if the contractor does not follow through, it’s all a waste of time. The problem as I see it is thar many contractors don’t seem to want to change their ways and want to continue in the same way as before. First of all they are not subject to licensing or having to get their work inspected before acceptance (and having to fix theor mistakes at their cost). They get vexed if you ask them to do something a particular (in some cases the right) way, or they’ll ask for more money (incredible if you asked them to do it right to begin with), or they tell you they’ll do it and then don’t follow through, or they’ll do it as long as you’re standing there watching and then go back and do it how they want (quick and easy). It really boggles the mind and is a huge impediment to progress. What is with these people who seem so opposed to learning how to do things better and more efficiently? They’d make a lot more money and would have much to be proud of.